Being one of my favourite songs by The Maine, you’d think I’d love everything about it. But to be honest the meaning I get from this song actually worries and depresses me which is weird since the lyrics are looking back on their happy memories. There’s another line too: “…it felt like we did so much back then” – as if they’re looking back at how their lives felt really exciting when they were teenagers, and this scares me because I really feel like I’m going absolutely nowhere right now. I have to revise to do tests in subjects I don’t like to get qualifications I don’t care about so I can get a job I don’t want. I feel like I’m wasting my time. I’m young, I’m healthy, physically this is the best I ever will be. And I have to spend my time doing homework I can’t be bothered with to please teachers I hate. I have never felt this hopeless in my life. The song is all about how they used to feel so alive and like they were living to the full, and it terrifies me because I feel so dead and like I may as well not be living at all for all I’m accomplishing. And it scares me to think: does it really get worse? Does it? Click the title to listen to the song, by the way. You are NOT Your Stereotype. Look around at the people in your school, what do you see? Clear, separate, divided groups, each labelled with a stereotypical name which defines everyone in that group. For example, there’s the chavs, the populars, the nerds, the freaks and more. But, judging people by their stereotype is incredibly wrong and why it should stop influencing us. Each one of us is an individual; we are all completely different from one another. So isn’t stereotyping pointless? No two people are the same; who says you have to be in the same ‘group’ as each other to be friends? Life would be much easier if we could all be our individual selves and express our individual personalities instead of suppressing who we are to make sure we’re in a particular group. 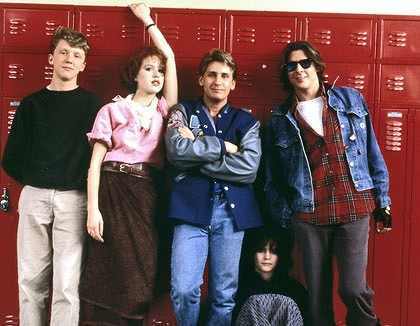 I love “The Breakfast Club”. It’s a great and funny movie but it also shows that stereotypes are a ridiculous concept. This point is made in the film when the Bender (the criminal) falls for Claire (the princess) and Andrew (the athlete) falls for Allison (the freak). The relationship the characters develop through the film proves that despite what we might think, we are so much more than what our stereotypes give us credit for. There is no law that says a ‘Princess’ can’t be friends with a ‘Nerd’, so we should stop letting ourselves be divided by these meaningless categories. People often blame the media; particularly newspapers for badly representing the youth of today, but in reality the pressure of stereotypes is pushing people to do the stupid things we read about in the newspapers. As each stereotypical group has a reputation, many teenagers feel pressure to act a certain way to make sure they’re in one of the cooler groups. This is why so many people are willing to behave antisocially to gain the reputation they want. 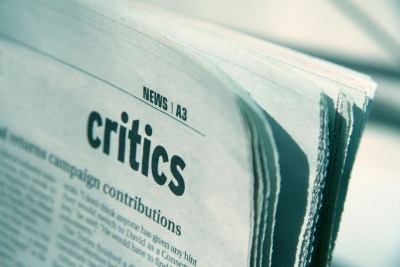 Newspapers will write negative stories because they are often more exciting, and everyone knows it. The teenagers who do this want the negative attention to get them labelled as cool and rebellious by other teenagers. The pressure of stereotypes is becoming strong enough for people to break laws and ruin their futures; this is ridiculous and needs to stop. Another movie I love is ‘Mean Girls’ which shows the pressure to fit in when the personality of Cady completely changes through the film so she can fit in with the ‘plastics’ and be popular. What happens here is wrong as nobody should ever be made to feel like they should fake their personality just to fit in. We should not have to fit into a ‘category’; we should be ourselves and find the people who accept who we are because they’re our real friends. Stereotypes make many people feel like they can’t be themselves because their real personality isn’t good enough, when this is incredibly wrong and knocks people’s confidence for no valid reason. I strongly believe everyone should feel comfortable with who they are; everyone should feel able to be friends with whoever they want; everyone should feel like they can be accepted by society without having to be cool. This is all possible if we stop judging each other by our stereotypes and stop caring about whether we are cool or not. You know when you do something, and you think “God, what would my friends think if they knew”, that’s how I’m feeling right now. 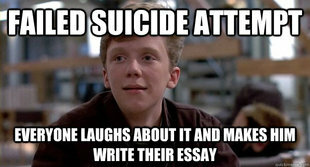 That’s because I doubt my friends at school would consider my blog ‘cool’. So, I came to decide that I just won’t tell any of my friends I write a blog, no big deal right? Wrong. If you’re hiding your blog from your friends, what are your friends hiding from you? If you’re not honest with them, and they’re not honest with you, are they even your friends at all? What’s friendship without trust? Nothing. So, do any of us actually have any friends? I don’t know. And what if we’re hiding so much from our friends that who they think we are isn’t who we are at all? Or if our friends are hiding so much from us that who we think they are isn’t who they are either? Does this mean that all our friends are just figments of our imaginations, just things we built up out of lies and half-truths and assumptions? Or are we figments of other people’s imaginations? Are there even any real people left in the world? If not, then where did all the real people go? The answer, I think, is they were crushed into nothing when somebody somewhere divided society into a few categories and forced everybody to fit into them. Once I think there were just people, now there are pretty people and ugly people. There are cool people and un-cool people. There are sluts and chavs and hipsters and freaks and more. And in our desperation to be ‘cool’, we buried our real selves and pretended we fit into the ‘cool’ section, even if it means we have to be mean and scruffy and dumb and we have to do things we don’t want to do, wear clothes we don’t feel comfortable in, listen to music we don’t enjoy, and be friends with people we don’t like. What have we done to ourselves? As you probably don’t know, I’m a runner, I train at an athletics club and gosh darn I love it. My favourite distance is 300m (equivalent of 400m for my age group). It’s just such a perfect distance y’know… not so short that you can’t get your speed up, and not so long that you have to run slow and die and stuff. Running 300m is basically my life. My foot’s been hurting a lot recently, though. I took a couple weeks off training over Christmas and it was feeling better. But yesterday I went to training, excited to run some 300’s, but after three my foot was killing me, so I stopped. My coach spoke to me and said those awful words no athlete wants to hear “It sounds like a stress fracture”. DAMNIT! I internally screamed. My doctors appointment is on Monday, and I’m so nervous. I’ve been researching stress fractures non-stop this evening and I’ve found that I could be not allowed to run for 4 – 16 weeks, this means I could be out of training for 4 FREAKING MONTHS! That would completely ruin everything for my summer season, I’ve been working so freaking hard this winter and to have it ruined by injury would honestly emotionally destroy me. Imagine making a sculpture, writing a novel, revising for an important exam, or something like that. Then imagine, something you couldn’t control smashing your sculpture, deleting your manuscript, ripping up your paper, and having to watch as all your potential success slips away and realising that now all your hard work counts for nothing. Yeah. That’s basically it. But that isn’t true. Although a part of your brain knows it, a larger part simply accepts it and feels defeated. Why? Probably because the voice is a part of you. H&M is my go-to shop whenever I need anything, and I mean anything. From jumpers to dresses to swimwear I always look in there before anywhere else. For me, H&M is the perfect shop: gorgeous, good quality clothing for affordable prices, what else could you possibly want? Just a few of my favourite things from the website at the moment, I plan on buying a lot of them and already own the jumper. What do you think of them?